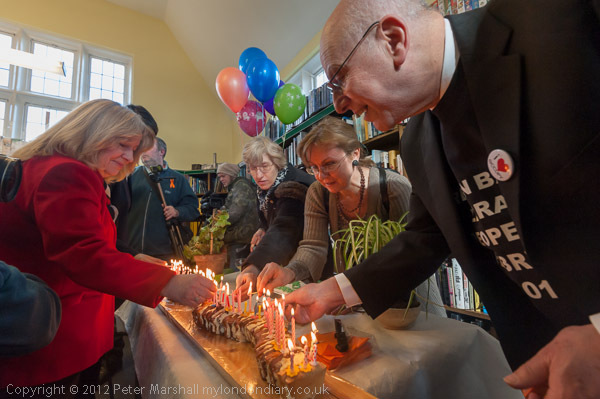 One of the most pleasant events I’ve photographed was this weeks official re-opening of Friern Barnet library, something that may become to be looked back on as a pivotal moment in the history of both the Occupy movement and left opposition, if not in democracy itself, in this country and the start of a real and powerful localism, with squatting activists from Occupy and usually conservative residents associations coming together with campaign groups and local opposition politicians to defeat the local authority. The library, which Barnet council had closed and locked up in April 2012 was occupied at the start of September when, a couple of days after the act making squatting in residential property, activists climbed in through a convenient ‘open window’ and made their home there. Within days with the help of the local campaigners they had reopened the library and it was soon stocked with 10,000 books donated mainly by local residents. 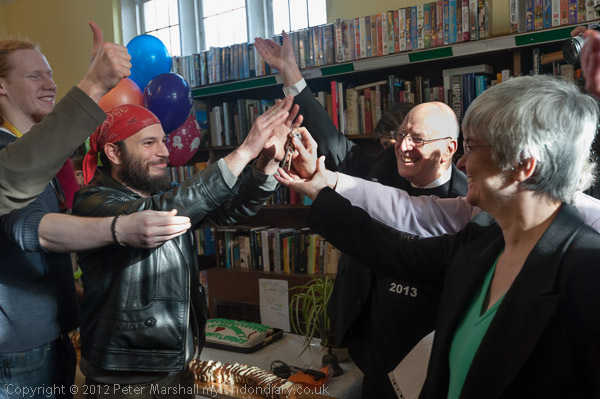 You can read my account of the celebrations and how the battle with the council was won at Friern Barnet Library Victory Celebration, and see my pictures from the event. There is more detail about the role of Ugo Hayter and others from Leigh Day & Co (“a highly distinctive law firm who is not afraid to take on challenges that would daunt many others”) on their web site. 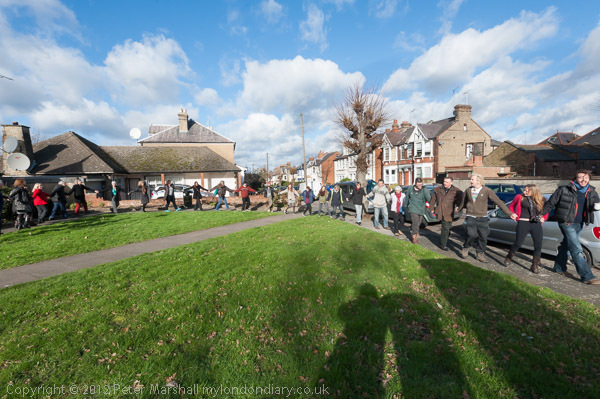 The occupation meant the council had to go to court, and the legal arguments led to Barnet negotiating a lease for a newly formed Friern Barnet Community Library (FBCL) company. I felt rather bad that despite several personal invitations I hadn’t made my way up to the library during the five months of occupation. (It has been a busy time for me and although it is in London, it isn’t the easiest place for me to get to and my journey on Tuesday morning took a couple of hours with three trains and a fairly long bus ride. Coming home the trains didn’t quite connect as well and it took a little longer.) So I went hoping to make up a little for my lack of effort by taking a set of pictures that captured something of the atmosphere of the event. I think I was fairly successful, despite a few problems. Contrary to the weather forecast I’d heard early in the morning the sun came out and gave some extreme lighting at times, particularly inside the library, with patches of bright sun on relatively dimly lit shadow areas. The library ceiling was just a little high to effectively use bounce flash – and it with the flash needing to fire at full output, recycle times on my Nissin unit of 3-4 seconds were too limiting. Direct flash fill that made a difference also gave nasty shadows, so I decided to work without flash and try to even things out a little in post-processing, setting my usual one-third stop of underexposure which I thought would be enough to prevent the highlights burning out. When it came to process the RAW files, I found that in some pictures it hadn’t been quite enough, and perhaps a full stop would have been better. 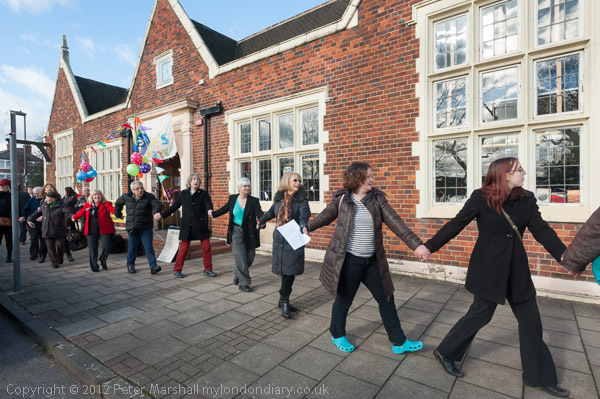 After a few speeches and the handover of the keys, people from all the groups involved who had worked together to save the library joined in a long chain holding hands and walked around the two small green spaces at each side which they also hope to preserve from development. 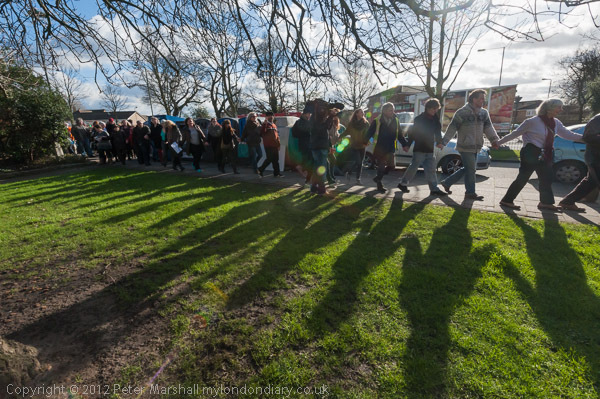 There were some great shadows of the human chain across the grass, but I had to work more or less directly into the sun to use them, and the inevitable flare and ghosting wasn’t too kind to me. But in some ways my favourite images of the day were of them dancing past the front of the library. Afterwards the local councillor who had been closely involved cut a ribbon stretched across the door (the only part of the proceedings where I couldn’t really find a good position with TV crews and other photographers having lined up while I was busy photographing the walk around the greens) everyone went inside for more speeches, and the cutting of two celebration cakes, one a long ‘bookworm’ cake with a long line of candles. It took half a dozen people to light them all, and I felt their cooperation and the glowing candles was a good expression of the cooperative effort that was involved in the saving of the library. There had been so many opportunities for pictures during the event that I was surprised when one of the occupiers said to me as I was leaving that some of the press weren’t happy with the pictures they had of the actual handover of the keys and wanted to stage another picture outside the library. I submitted a picture of this clearly captioned as a re-staging of the handing over of the keys for the press outside the library, but other photographer’s pictures of this same staged tableau were published in the press as if they were the actual event. The pictures almost got taken with a large brass key from a photographer’s key ring rather than the actual library keys, but fortunately the right ones were produced just in time. But I felt it was a false and clichéd approach, although one of the press photographers there has argued emphatically that this was a display of professionalism. Not in my book. This entry was posted on Friday, February 8th, 2013 at 05:14 pm and is filed under My Own Work, Photo Issues, Political Issues. You can follow any responses to this entry through the RSS 2.0 feed. You can leave a response, or trackback from your own site.